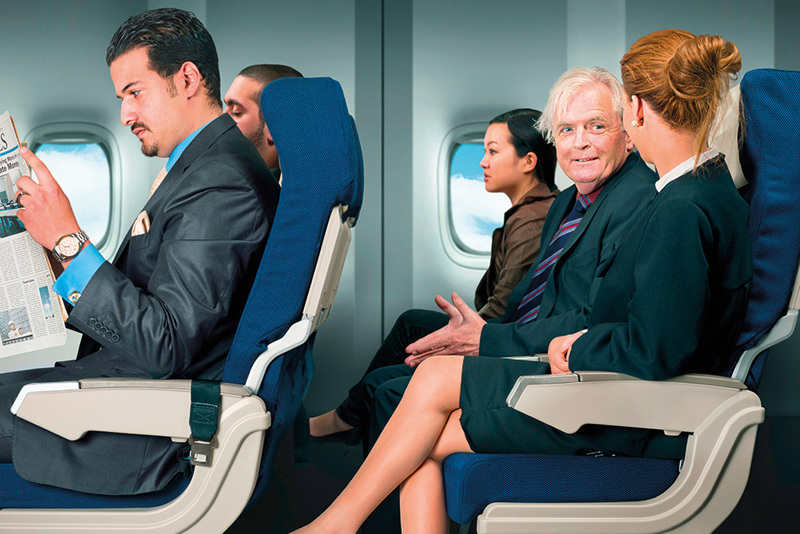 It may matter what air travellers wear on the plane. That’s not just the case for the legging-wearing teenage girls denied boarding on a United Airlines flight this spring. The two girls were flying on United’s pass programme, which lets friends or relatives of airline employees fly free or at discounted rates. The catch is a dress code. But even for those paying regular fares, there is a dress policy, of sorts. United, Delta Air Lines and American Airlines all list bare feet as grounds for removal from flights in their official contract of carriage documents, for example. United’s policy also covers passengers “not properly clothed”, and American’s warns that the airline may refuse to transport passengers “clothed in a manner that would cause discomfort or offence to other passengers”. Hobica told of wearing a navy blue suit on a United flight a few years ago from Kennedy International Airport in New York to Los Angeles, where he lives. “I was in the lounge, where everybody was dressed in sandals and gym clothes, and I heard them call my name,” he said. He thought he was being bumped, but instead he was upgraded to first class. “I don’t have status on any airline,” he said, “because I only buy based on price.” He concluded that the freshly pressed suit was the source of his luck. Hobica then relayed tales of friends who had been upgraded while wearing clothes they considered nicer than what they might wear to the gym or the grocery store, and a conversation he once had with a gate agent friend at Lufthansa. But if no one on the flight warrants special privileges, the absence of ripped jeans or tattered sneakers can help, Hobica said. Ashton Morrow, a Delta spokeswoman, said her airline, like most, adheres to set corporate practices that do not take appearances into account in selecting passengers for unexpected perks. Still, dressing well for flights may yield more subtle benefits. “I will say that when I see someone come on the plane and they’re dressed nicely and their children are dressed nicely, I do take notice,” said Kate Linder, an actress and a United flight attendant since 1978. That does not mean, she said, that she will pour full cans of ginger ale for the well-dressed passengers while their neighbours in flip-flops receive half cans, or that she is more inclined to be especially attentive to those well-dressed passengers. But she said she remembered a time when most customers considered flying an occasion to dress up, and she suspects that one result was increased civility for everyone on board, particularly those who paid closest attention to their appearance. “When someone is a little dressed up and looking like they made an effort, it’s almost like they’re showing respect for themselves and for everybody else on the plane,” said Linder, of Los Angeles, who has maintained her career as a flight attendant while also appearing on the TV soap opera “The Young and the Restless”. “My opinion is that when you take pride in how you look, you take pride in how you act,” she said. Nancy Marquis, another longtime United flight attendant, retired in 2007 but is still a frequent flyer. She said she understood the inclination to dress “like a slob” on a plane. When she became a flight attendant in 1969, seats were bigger and security was not as much of a bother. Marquis, of Glen, New Hampshire, said she thought the evolution of less formal dress for flights could be traced to 1978, the year the Airline Deregulation Act became law. “That was a definite demarcation line. New airlines started popping up and fare wars started,” she said. For many, the democratisation of air travel meant that buying a plane ticket no longer merited a trip to the dry cleaner. But one thing stayed the same, Marquis said: Regardless of where passengers were seated on a plane, in economy or in a premium section, everyone dressed similarly. Before deregulation, everyone was dressed for a business meeting and no one wore jeans, she said. Now, no one is dressed for a meeting and everyone wears jeans. There is a relatively new twist to that trend of dressing similarly. Airlines including American, United and Delta have started offering first- and business-class international passengers free pyjamas on overnight flights in recent years, according to Sumers — something he said was more closely associated with Asian and European airlines. One result could be an antidote to the withering looks from passengers who do not approve of seatmates’ hoodies and sweatpants, and an overall avoidance of skirmishes over what is appropriate aeroplane attire.